WILDLIGHT, FL – July 11, 2017 – Today, D.S. Ware Homes (D.S. Ware) announced that it has been selected as one of the residential homebuilders for Wildlight, a new town being developed in Nassau County. Founded in 1983, D.S. Ware has a long history of building quality and affordable homes in desirable locations throughout Northeast Florida. D.S. Ware will build homes in Wildlight’s Village Center neighborhood. Over the next few weeks, D.S. Ware will work closely with Wildlight on construction plans to fit the community’s architectural guidelines – the Wildlight Pattern Book – that also remain true to the area’s natural landscape. D.S. Ware plans to break ground on its model homes this summer. In addition to residential homes and neighborhoods, the first phase of Wildlight will also include the Village Center, with planned retail stores and restaurants, Wildlight Elementary School, office space, recreational parks, and biking and walking trails. Wildlight also boasts a high-speed fiber network designed to deliver one-gigabit-per-second services. D.S. Ware Homes is a premier new home builder in Jacksonville, Florida, building in communities in Duval, Nassau, Clay and St. John’s Counties for over 35 years. Under the leadership of Donnie Ware and Tony Raso, the D.S. Ware team has over 100 years of combined experience building superior quality and beautiful homes focused on comfort and detail. D.S. Ware Homes maintains a philosophy of creating “customers for life.” Through their 4-step process, D.S. Ware Homes strives to keep their customers involved throughout the entire build, resulting in a happier and more informed buyer. D.S. Ware Homes has received repeated superior rankings from J.D. Power and Associates for their unrivaled customer satisfaction and warranty program. Wildlight is envisioned as a new town inspired by a character, culture and pattern of living that we call “Florida Lowcountry,” where play is a part of every day and the natural world is a natural part of life. 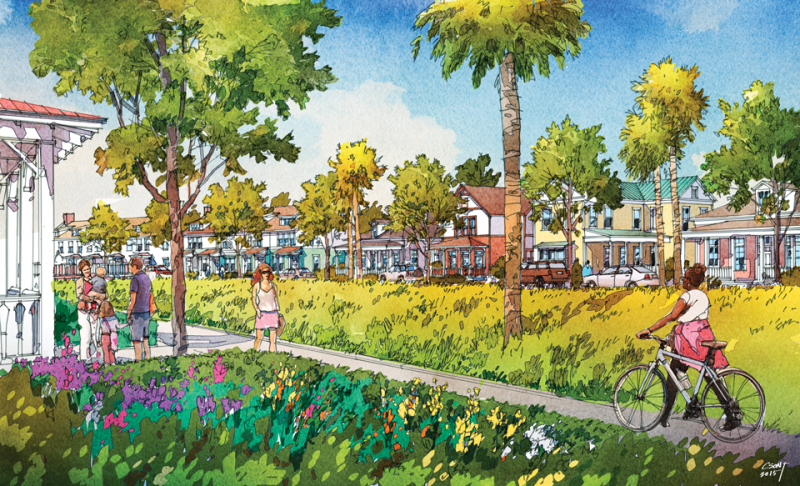 The plan for Wildlight includes a mix of homes, townhomes and rental apartments together with shops and restaurants, parks, gardens and playgrounds, a new elementary school, and a system of trails and pathways intended to make it healthy and walkable and connect it all together. Our Phase 1 plan is flexible and currently designed for about 1,000 homes across about 260 acres plus nearly 350 acres of permanently preserved open space. Wildlight will offer comfortable and friendly Florida Lowcountry living 20 miles north of Jacksonville, just east of Interstate 95 on A1A, with easy access to both Amelia Island and the Jacksonville International Airport. Wildlight is being created by Raydient Places + Properties, a subsidiary of Rayonier. For more information please visit wildlight.com.